Mikka Kiprusoff established a new franchise record with his 263rd victory in a Flames uniform making 35 saves in Calgary’s 4-1 over the Montreal Canadiens on Thursday night. 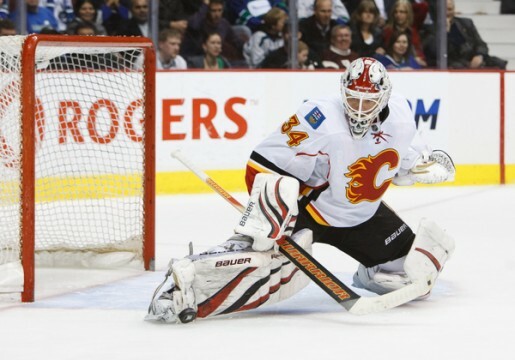 Kiprusoff and the Flames picked up their first win of the young season spoiling Montreal’s home-opener in the process. Despite being out-shot 36-25, the Flames were able to take full advantage of their scoring chances en route to the surprisingly comfortable win. Having scored first in their previous two games but ultimately going on to lose, Calgary seemed unphased by falling behind early and took adavantage of two Montreal penalties to claim the lead. Rene Bourque scored with the man advantage on a feed from Alex Tanguay to tie the score, and four minutes later Calgary’s power-play again looked sharp as Oli Jokinen spotted Niklas Hagman in the slot who placed a perfect shot over the glove-hand of Montrel net-minder Carey Price. David Moss would then close out the first-period scoring with his first of the season as he was the beneficiary of another beautiful Tanguay pass. Already with four assists through the first three games of the season, Tanguay is picking up right where he left off a year ago when he pieced together a productive 69 point campaign. The play in the second period tightened considerably with Montreal carrying the bulk of the play. Kiprusoff and a stingy Calgary defense kept the Habs off the scoreboard until a hard-working shift by the line of Bourque, Hagman and Matt Stajan gave the Flames the three-goal cushion that would more-or-less deflate the Habs. Stajan fired a shot off Price’s shoulder that he awkwardly turned aside but the Calgary center’s persistence on the puck paid off with a second shot oppurtunity with Bourque banging in the rebound. From there, Kiprusoff shut the door on Montreal leaving the home fans disappointed after the night began with such enthusiasm and optimism some three hours earlier. Calgary now travels to Toronto for a Saturday night affair where they will take on a Maple Leafs team who hasn’t played since last Saturday night. The Flames will certainly be looking to ride the momentum of the Montreal victory and perhaps catch the Leafs (2-0) off-guard following their lengthy seven-day layoff between games.